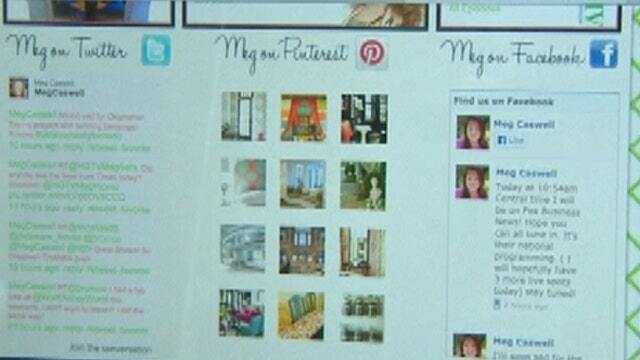 HGTV interior designer Meg Caswell breaks down social media's impact on business. HGTV star Meg Caswell, who hosts the show “Great Rooms with Meg,” tells FBN’s Jeff Flock that social media has been invaluable to her as an interior designer. “I’m on Facebook, Pinterest, Twitter, Tumblr … I think it’s really important that all designers really get inspired by other people and see what they’re doing, but also find the opportunity to express what you’re doing yourself with your clients,” says Caswell. Of all the social media sites, Pinterest in particular is a huge focus for Caswell, as the site provides a venue to easily share pictures and design ideas with colleagues, clients and fans. Users can click on photos to access online storefronts, where they can buy the featured items. “Pinterst is where, as designers and people, we can pin what things we’re inspired by, what projects we want to do and what projects we have done. We can just share it with everyone else out there,” explains Caswell. “It’s a great way for businesses to get their foot in the door,” says Caswell, noting that if she“pins” an item or fabric, all of her followers can see that she likes it, giving it an endorsement of sorts. But with any endorsement comes ethical issues –and Caswell says it’s important to make sure you’re engaging honestly with your followers on social media. “I actually do not use social media as an advertising space,” she says, as it would damage her credibility with fans if she stood to make money off the items she pins. The site is most valuable, she says, as a brand tool that lets followers know they’re gaining real insight into her design sensibility. “I want people to find credibility in what I’m inspired by,” adds Caswell.